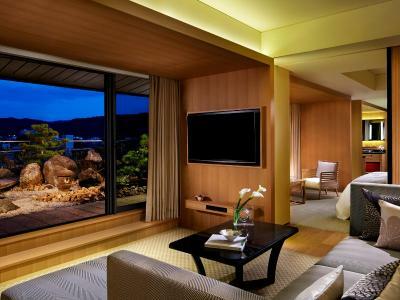 Lock in a great price for The Ritz-Carlton Kyoto – rated 9.3 by recent guests! An excellent hotel with polite, courteous staff who pander to your every need. The rooms are exquisite and wonderfully comfortable while the restaurants are all top-class. Meanwhile the facilities are all superb while outside activities and recommendations are no trouble at all the concierge. We have stayed here both as a couple and with our children (3 children under the age of 7) and both times we have been made extremely welcome. For those without children this is a wonderfully intimate hotel while for those with children are made feel incredibly welcome with wonderful activities for the kids to take part in - the combo of catering to both these groups, in my experience, is an extremely rare feat to achieve. Easily one of the best hotels I have ever stayed in. 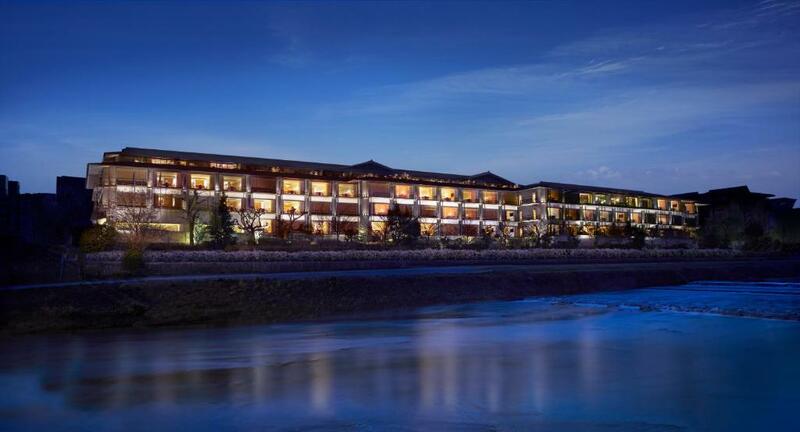 The Ritz-Carlton Kyoto This rating is a reflection of how the property compares to the industry standard when it comes to price, facilities and services available. It's based on a self-evaluation by the property. Use this rating to help choose your stay! 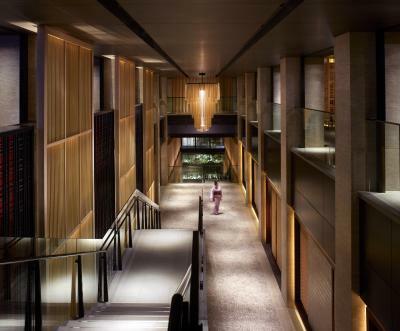 One of our top picks in Kyoto.Opened in February 2014, this luxury 5-star hotel features high-standard services and guestrooms that are among the most spacious in Kyoto. 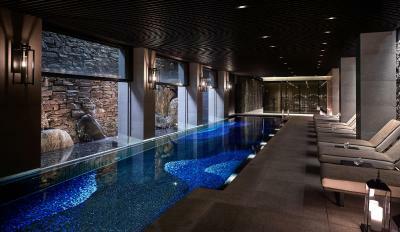 Guests may enjoy complimentary use of the indoor swimming pool and the fitness center during their stay. Free Wi-Fi is available throughout the property. 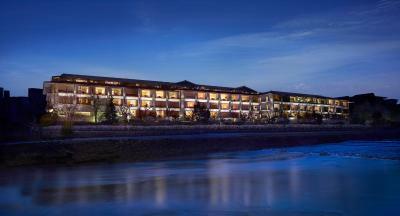 The Ritz-Carlton Kyoto is located right along the Kamogawa River, offering iconic Kyoto views. Kyoto Shiyakushomae Subway Station is just a 3-minute walk away, while JR Kyoto Station can be reached within a 10-minute subway ride. Nijo-jo Castle, one of the World Heritage Sites, is a 3-minute subway ride from the hotel. Featuring traditional Kyoto esthetics and sophisticated elegance, each room is fitted with a large flat-screen TV, a Blu-ray player and a Nespresso coffee maker. The private bathroom comes with a rain shower, a bath tub and a mini LED TV. While staying at the hotel, guests can feel rejuvenated with massage treatments at the spa or enjoy workouts at the 24-hour gym. 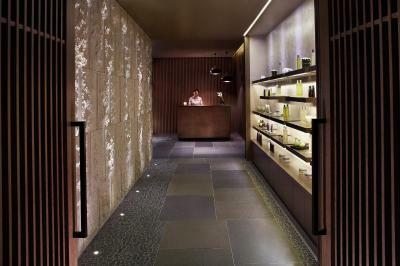 A 24-hour front desk and concierge services are offered. The business center is also available 24 hours. 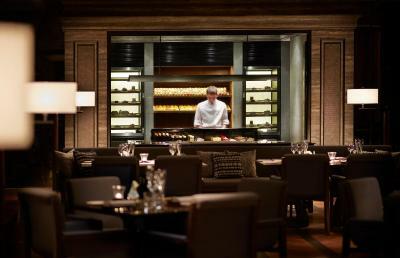 La Locanda restaurant serves colorful Italian dishes featuring select ingredients from all over the world. 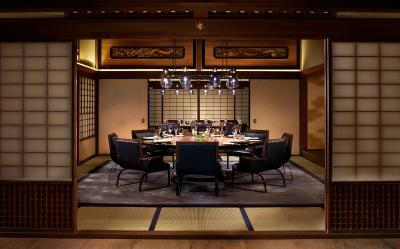 Delicately prepared Japanese kaiseki multi-course meals and sushi can be savored at Mizuki restaurant. Pierre Hermé Paris offers delicious French sweets including macaroons. Featuring traditional Kyoto esthetics and sophisticated elegance, this very spacious room is fitted with a large flat-screen TV, a Blu-ray player and a Nespresso coffee maker. The private bathroom comes with a rain shower, a bath tub and a mini LED TV. Private parking is available on site (reservation is not possible) and costs JPY 3000 per day. 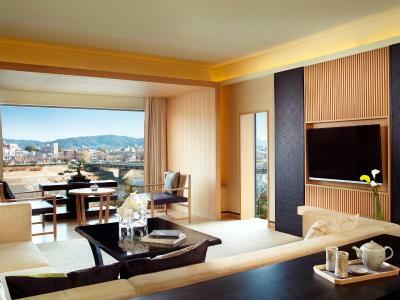 This corner suite features a living room with floor-to-ceiling windows with views of Higashiyama Mountains and Kamogawa River. The private bathroom comes fitted with a bath, a hairdryer and plush bathrobes. This corner suite features a spacious dining and living room area with expansive windows facing south. 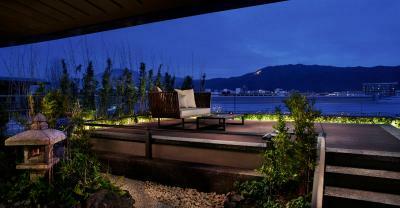 Magnificent views of Kamogawa River and old town Kyoto can be enjoyed. The private bathroom features a bath, a hairdryer and bathrobes. 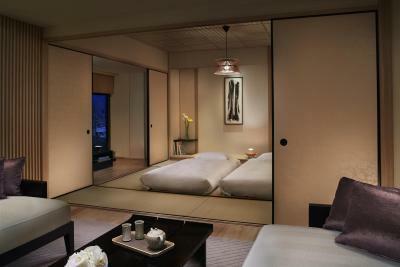 This corner suite features a spacious living room area and a tatami (woven-straw) flooring room with traditional Japanese futon mats. 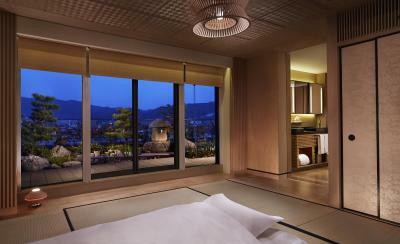 Floor-to-ceiling windows offers view of old Kyoto. The private bathroom comes with a bath, a hairdryer and bathrobes. Each features a large window looking out onto a Japanese rock garden. The private bathroom comes with a bath, a hairdryer and bathrobes. Spacious rooms with complimentary WiFi access, an LCD TV and an iPod docking station. Each also comes with a seating area by the window. The private bathroom features a bath, bathrobes and designer brand amenities. This one-bedroom suite features a spacious living room with comfy seating and a view of the private Japanese garden. The private bathroom features a bath, bathrobes and a hairdryer. This one-bedroom suite with a private Japanese garden and a terrace features fantastic views of the Higashiyama Mountains from the living room, bedroom and bathroom. The private bathroom features a bath, bathrobes and a hairdryer. This garden terrace suite features a private balcony with sweeping views of the Higashiyama Mountains and Kamogawa River, as well as a tatami (woven-straw) flooring room with traditional Japanese futon mats. The private bathroom comes with a bath, a hairdryer and bathrobes. 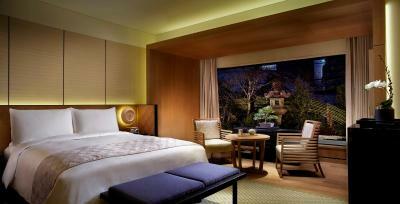 Rooms feature large windows with magnificent views of Kamogawa River and the Higashiyama Mountains. The private bathroom comes with a bath, a hairdryer and free toiletries. This suite features a spacious living room with a large sofa and a working desk. Magnificent views of Kamogawa River and Higashiyama Mountains can be enjoyed from the floor-to-ceiling windows. The private bathrooms come fitted with plush bathrobes, a hairdryer and a bath. This one-bedroom suite features a Japanese garden and a furnished terrace with panoramic views of the Higashiyama Mountains. The suite also comes with a spacious living room, a dining room and an private bathroom with a bath, bathrobes and free toiletries. 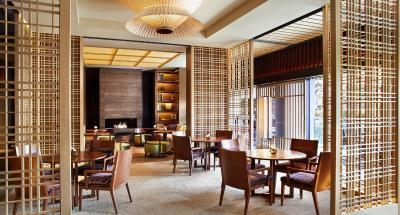 House Rules The Ritz-Carlton Kyoto takes special requests – add in the next step!